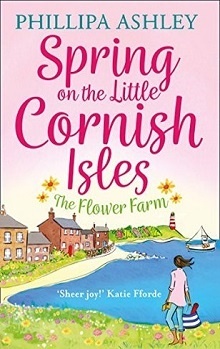 Philippa Ashley returns to the blog as she takes us to the Isles of Scilly off the Cornwall coast to bring us the story of Jess and Will, narcissi farmers and twins as they navigate life, business and love in their little corner of the world. First meeting Jess and Will in Masie’s story when she came back to Scilly, the twins have managed the farm since their father’s departure with another woman years ago. Neither had really planned to HAVE to stay on the island and make the business their life, but their loyalty to their mother and the need to have something to support the family is at the forefront. With Jess confused and heartbroken with Adam’s departure without a word, a new seasonal employee named Gabriella with her own challenges to meet and the undeniable connection she and Will seem to have, Will’s anger with Adam for leaving without a clue and his frustration in being tied to the farm, that often results in his mercurial moods, and his struggles to finish the old rowing boat in time for the race. Every moment on Scilly is s a joy: even with the isolation and struggles Jess is so desperate to move forward from Adam and her hurt, and Luca seems to provide the perfect option , and he’s pursuing her. Gaby arrived and both she and Will were shocked at her willingness and ability to jump into the work: her PhD in poetry and tiny stature, as well as an obvious fear of being on the water didn’t seem to fit_ but her rapid-fire responses to Will’s teasing (yes – he is like a 12 year old boy when it comes to her) gives Jess reason to think there may be a connection. But, as she is here to work and fulfill one of the many dreams she promised to chase, she’s intrigued by although confused by the on again off again behavior of Will. And then, the rowing practice starts and Gaby, against her better judgment (she was cox on a boat at school and ran them into trouble) is roped into the crew – a crew that now needs to (according to Will) beat Hugo’s team with it’s obvious ‘ringer” Luca. A suave, handsome and actually a bit too smooth man who has set his eyes on Jess. Until Adam returns with a woman and child in tow – and no explanations, sending Jess into a spiral of confusion and hurt as she tries to move on with the next best thing: someone who wants her. Philippa Ashley has captured the hearts of readers with this series: giving us insight into Jess and Will’s lives at home: the struggles of managing the business and having to rely on the vagaries of wind and weather for shipments, the dearth of ‘dating’ options, and the wonder about what life could be like elsewhere With Adam’s story, we have proof of Jess’s undying loyalty and commitment to the man, even when she believes that love and togetherness is not possible. For Will, his head is actually spinning about with new (to him) feelings for Gaby, and his selflessness in not asking her to stay as he’s sure she wants to travel about. Gaby, coming to Scilly to get away from the sorrow and guilt after her brother’s death, and trying to shore up her confidence by envisioning his approach to the world….. Oh love and angst and plenty of change are on the breeze in this one. A perfect getaway read, with visits with familiar characters, moments of heart, struggle and pure love: the story just keeps you turning pages and hoping for more time on the isles. What a terrific setting for a series! It is! I’m obsessed with the isolation and how it brings people together in that setting – Jenny Colgan’s Beach Street Bakery series has many of the same sort of challenges.. another series I love.